Lawns cannot live without air, water, and nutrients. When air has been squeezed out of the soil by heavy trampling, roots cannot grow efficiently. Many lawns that receive heavy use (traffic) have compacted soil that restricts the movement of air and water to the roots. 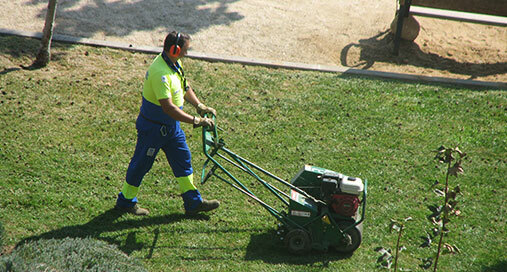 Aerating the turf can help rejuvenate the lawn by restoring passageways to the soil. Although these tasks are performed twice a year (Spring &amp;amp; Fall) or whenever compacted soil is present, they are just as important to a lawns long-term survival as are routine fertilizing and mowing. De-thatching is just part of the renovation process. Renovation also includes removing the debris left by the de-thatcher, then over-seeding the area with turf seeds. Finally, the area is top dressed with a layer of heavy compost or top soil. Aeration consists of perforating the soil (and any thatch above it) with small holes that allow water, air and fertilizer to get closer to the roots. This process enables the roots to grow more deeply, producing a more vigorous lawn. Thatch is a layer of slowly decomposing grass, stems, dead roots that accumulates above the soil and below the grass blades. The name thatch is well deserved. Like the thatch roof on a tropical hut, it stops water and fertilizer from reaching the soil. Turf that has a build-up of thatch feels spongy when you walk on it. Insects and diseases find thatch a particularly suitable place to inhabit, since water does not readily penetrate thatch, neither do pest and disease control products. Finally, because the thickness and density of thatch varies, lawn mowers are more likely to cut unevenly causing scalping of turf. Soil penetrants, or wetting agents, counteract the hydrophobic character of thatch, but only briefly. Bacterial agents that help break down thatch have proved somewhat effective, though again not long lasting. Physically, de-thatching the turf is the best solution when thatch occurs. De-thatching is done with a power driven mower like machine which has rotating vertical blades that rapidly cut out thatch.